You have captured this chaos in such detail and appeal. I don\'t usually like busy but I really like this photo. Signs everywhere. There is so much to see there. It\'s really a great shot ! Wow, marketing explosion! Great picture, though. Love the colors. So crowded and cramped yet it seems better than the strip malls around here. Excellent ! Great focus on the numerous signs ! The story behind "It’s a sign! 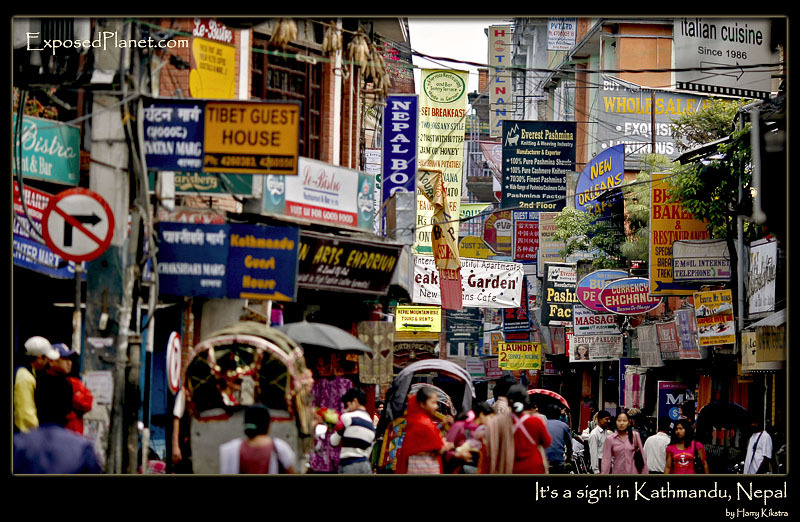 In Thamel, Kathmandu, Nepal"
Thamel is the tourist district in Kathmandu and a maze of small streets filled with restaurants, internet cafes and shops selling all kinds of handicrafts. Of course everybody want attention to their small shops, hence the signs (Made in German! It might look like a bit of a mess when viewed through a longer lens like this, but is is definitely worth a visit, a world in its own.